DailyDOOH » Blog Archive » Is @SodyoO2O’s FarQR The Next Generation QR Code? 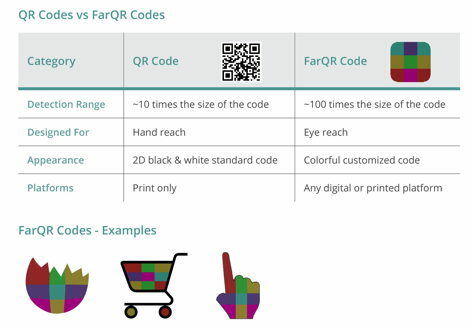 Israeli startup Sodyo has launched FarQR, something it describes as the next generation QR Code. FarQR Codes have a detection range of about 100 times the size of the FarQR Code – compared to 10 times the size with legacy QR Codes and as we said earlier, whilst their technology works on any digital or printed platform, their current focus is very much on TV. The company’s patented Color Vertex Point (CVP) technology is based on colorful tags that can be printed or digitally displayed on any media and can be detected by smartphone cameras at distances ranging from 10 centimeters to more than 100 meters away – the small, colorful tags can be branded and do not take up a disproportionate amount of real estate from ads or TV screens. The tags, once detected by a smartphone camera, can trigger instant offline-to-online interaction through billboards, street benches, posters, digital screens, in-store media, home and office TVs, PCs, magazines, and even product packaging. This entry was posted on Tuesday, June 27th, 2017 at 13:01 @584 and is filed under DailyDOOH Update. You can follow any responses to this entry through the RSS 2.0 feed. You can leave a response, or trackback from your own site.